Spending consistent devotional time with the Lord is something that I have never been very good at. I believe that this time is the most important time of my day. I believe that it helps me in ways that I don’t even know it, all the while drawing me closer to my Creator. But yet, I still have a hard time doing it. I desire to do it, yet a lot of days go by and I don’t spend a good amount of time with the Lord. 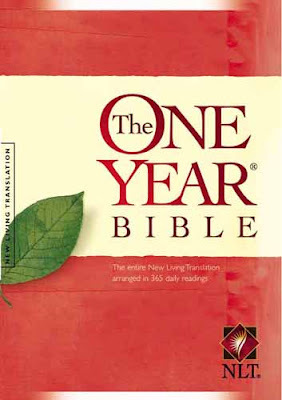 Recently I read a blog post by Vicki Courtney where she talked about the One Year Bible and how she has done it every year for TEN years. That is so amazing to me. After reading this post I remembered that I had a One Year Bible somewhere in my apartment. So I went searching for it and found it. I had attempted read through the bible a couple of years ago. When my life was pretty different, I was just a college student, no full time job, living with good friends and trying to find time to spend with my boyfriend. I checked my bookmark to see where I left off and I had made it to February 17th. Pathetic I know! So I decided to restart this little adventure, but with a different goal in mind. Instead of the goal being ‘read the whole bible’ my goal would be to use the specific day’s reading to spend time with the Lord. Going through different scriptures and using that page to journal and write prayer requests. So then I can go back and look at that day and see what I was going through, what my prayer request was and see the progress on that request. It’s like a journal just with a little remix. And I like a good remix. And I am writing about it on my blog because I have found that my own blog is good accountability for myself. If I write something on my blog I don’t want to have to write that I failed in it – if it is typed out in words then it is more motivation to follow through with it. That is why I will NEVER talk about my desire to one day run a marathon. I'm too busy watching The Bachelor and American Idol to run a marathon! I agree a great idea! I will have to check it out. Great idea! My mom gives me a daily devotional book every year that I try to read before going to bed everynight. Each devotional lists Bible verses that pertain to the devotional and I read those. That is my favorite time of day usually. Love that idea! Last year I started a read through the Bible in a year plan...I made it to about April. So, I can totally identify with you! I've never heard of this Bible...does it have space for journaling inside it? Or are you just using a separate journal? How'd you like American Idol last night? I kind of hate the preliminary stuff...but I always watch it anyway! I saw one of these One Year Bibles in Mardel, yesterday and almost bought one. I may have to go back and get one because I would love to read the Bible in it's entirety but it's really overwhelming when you just sit down without a plan. I'll be praying for you, during this year, that you're able to have a daily devotional time. It really is the most important time of the day. That is such a great idea! I actually have the One Year Bible and have began reading it myself this year. I hope I can stay dedicated to finishing it. I also found this blog through Kelly's Korner. It's her dad and he's doing a daily devotional. Just thought it might be something you want to look at as well. What a great goal! I really struggle with my quiet times as well. I feel like I have the exercise thing down (so far), and I am really finding myself SO thirsty for time with the Lord! I think that is a great goal! I think it is easier to stick to when you don't focus on the number and having to get it done in a year, but just looking at it as time with God. Some days you will forget or miss the mark (it happens to all of us), but you will just pick it up the next day and keep moving. God will still be there, but I think it is great to have accountability to keep it up everyday. I'm working on that too with my daily devotional! thanks for the comment. 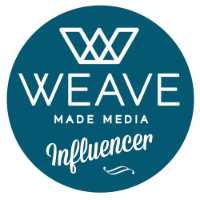 I know what you mean about accountability and your blog. I do it to. Good luck with the Bible in a year. I am tryin to do one but I get behind and kepp having to take my sundays and catch up. Good for you! I am the exact same way. I have a great devotional book that I need to get back out and start over. Great post, girl - and good idea with the accountability thing. I know that life gets so busy and we get so tired - i think we're all guilty of it! I hear you and can relate in so many ways. I'm excited you are going to do this. You will be changed. I love that you are going to journal and write your requests in this. Your husband will cherish it and so will your future children. I totally agree about not running a marathon. American Idol is way more important than that. I have tried to do this several times too and have never made it the whole way through. I get so mad at myself. Good luck and stick with it! I liked Vicki's post, too, and I think this is such a great idea!! First of all this post is awesome, I can totally relate to everything you said. 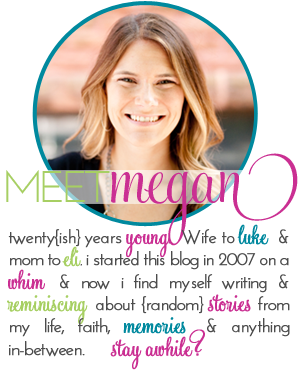 Second, my bloglines isn't updating your feed for some reason, so when I decided to come check on you since (I thought) you hadn't posted in a while I find out I have been missing everything in the land of Megan. I as well have the One Year Bible ~~ only in ESV. I heard a preacher of one of our local churches say that he has been reading his Bible through since 1978 ~~ WHAT? That is terrific, and with that I decided to fetch my OYBible off the bookshelf and give it a go. So glad we can do it "together". Love this post and loved this idea! I need to look into something like this and write about it on the blog so I actually keep it up. Maybe that's why God gave us blogs - no other forms of motivation were working. :-) Love you friend! hmm...i have a one year Bible. Maybe we should start a group over the blogs? Great goal Megan! I know you can do it!!! i am doing this this year too!